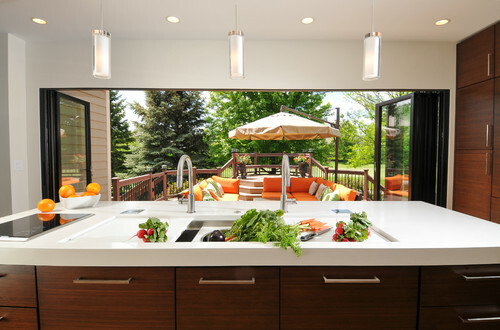 As a designer, I pay attention to trends that come and go in kitchen design. And there are a lot of new options to consider. 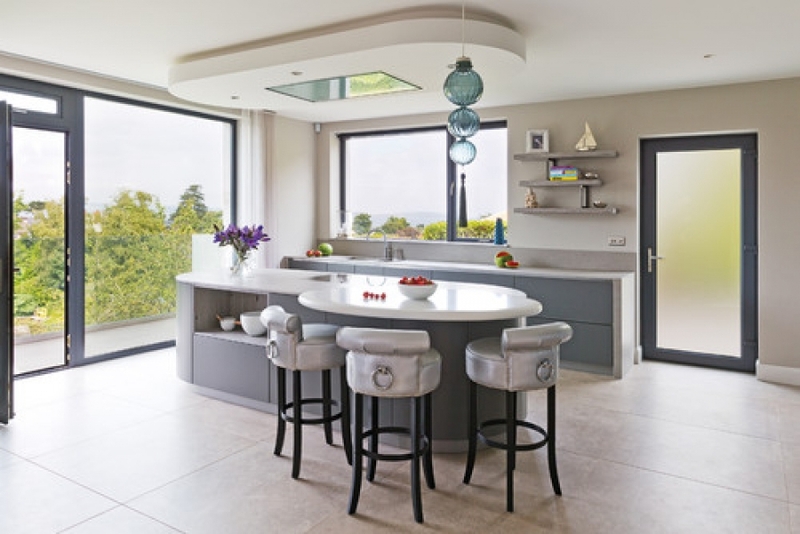 But I tell my clients that the key is always to consider whether what’s trending will actually function for your kitchen. 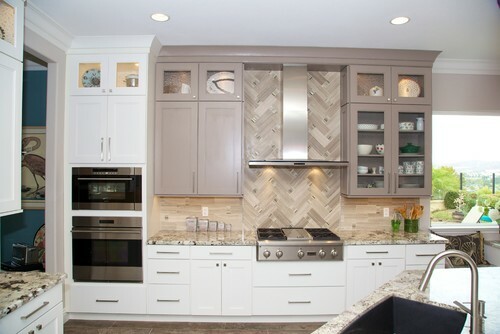 So let’s take a look at some of the current trends that I would argue are among the best options to incorporate into your kitchen remodel. Which ones would you love to have? 1. Fewer upper cabinets. 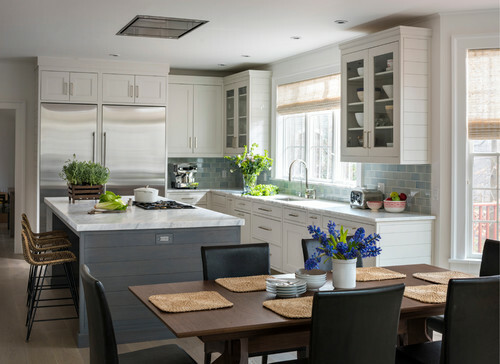 The trend toward less wall cabinetry in the kitchen will continue. It’s not that clients have less stuff to store, but rather that they desire less visual clutter and that feeling of openness that a lack of wall cabinets inspires. 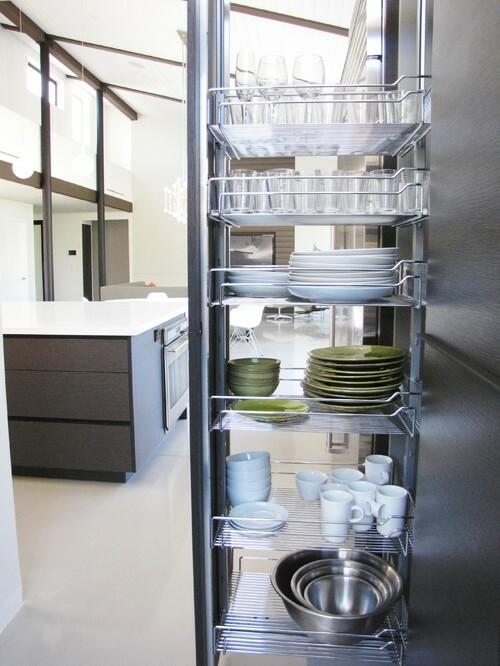 This means that clever storage solutions for both base and tall cabinets are even more important. 2. Comfortable seating areas. 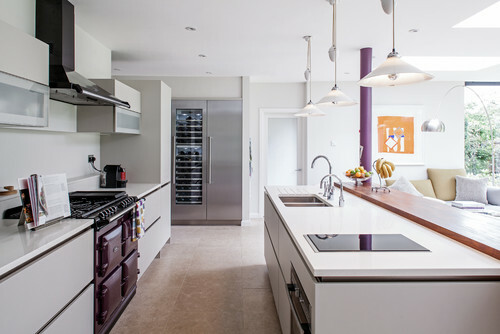 For years, islands have been considered the ideal gathering spot in the kitchen. But now there’s a trend toward more comfort, and seating areas in kitchens are evolving accordingly. Clients want a place to kick off their shoes and relax with a glass of wine while waiting for their dinner to cook. Expect to see more soft seating in the kitchen, like the light blue couch in this photo. 3. Steam convection ovens. My favorite kitchen appliance slowly gaining a foothold is the steam convection oven. Cooking with steam locks in nutrients and keeps foods moist. Unlike microwaves, steam ovens reheat leftovers without drying them out. As a bonus, there’s a convection mode that bakes and roasts. Will steam ovens replace microwaves? The answer probably depends on whom you ask. They still can’t reheat beverages or pop popcorn, and for some that’s a deal-breaker. 4. Induction cooktops. Induction cooking has been popular in Europe for many years, unlike here in the United States, where cooking with natural gas is preferred. With induction cooking, the energy is generated by a metal coil beneath the surface of the glass cooktop. When turned on, the coil produces an electromagnetic current only when it comes in contact with magnetic cookware. This current heats the bottom of the magnetic pan and cooks the food it contains. Induction is safe — the cooktop is cool to the touch when the cookware is removed. It’s also fast. Water boils in under two minutes. One way to introduce induction cooking into your kitchen is to add a burner or two. This kitchen has a gas range plus a small induction cook-top in the island. 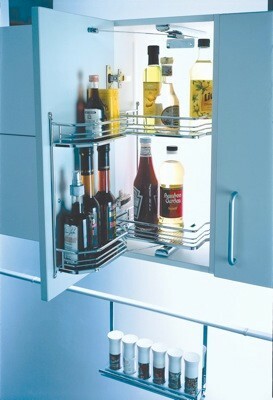 Smart refrigerators. Ever get to the grocery store and discover you’ve forgotten your list? Of course you have! A few of my trailblazing clients have purchased smart refrigerators equipped with an interior camera that takes a photo of the contents when the door is closed. This photo can be accessed while shopping from the corresponding app. Some refrigerators can determine when stocks are running low, make a list and even reorder. 6. Column refrigerators. 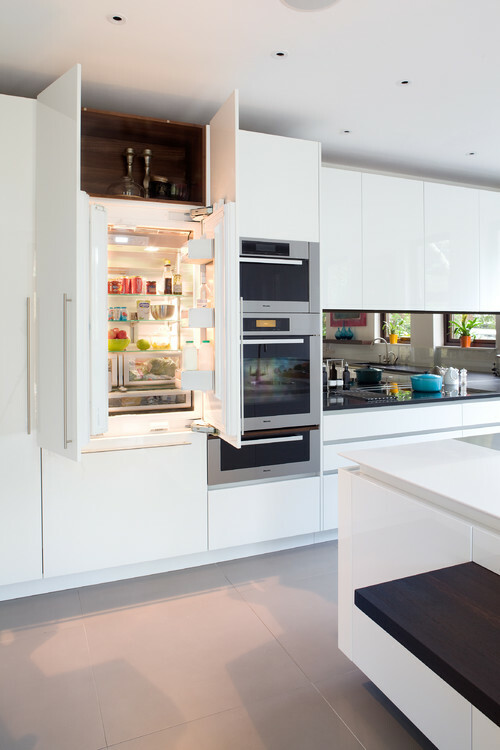 Unlike traditional refrigerators with their predetermined refrigerator-freezer spaces, column refrigerators are full-sized single units that are either all refrigerator or all freezer. They’re quickly becoming a client favorite due to the ability to customize chilling spaces based on one’s needs and preferences. 7. 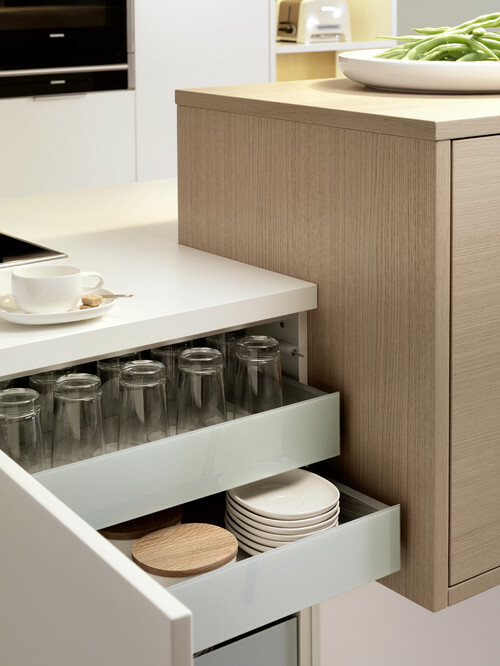 Servo drive cabinetry. A servo drive electrical system can open any cabinet with either a slight touch or a remote control. Though often found in more modern kitchens designed without hardware, this feature needn’t be reserved for the modern aesthetic. Even traditional kitchens can benefit from a servo drive trash bin. Nudge the cabinet door with your knee and the receptacle magically appears. 8. Lighted interiors. Interior lighting is no longer limited to glass-front cabinets displaying lovely dishes. 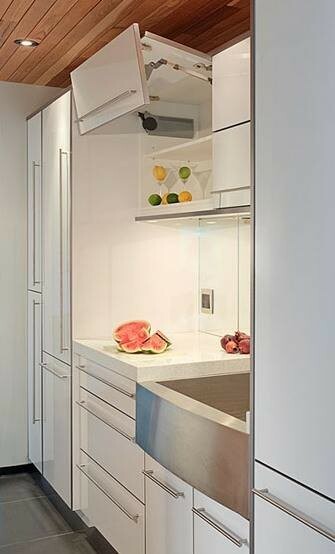 Pantry and base cabinets are often 24 inches deep with dark crevices, limiting the visibility of their contents — and what isn’t readily visible often doesn’t get used. Consider lighting the interiors of your deeper cabinets not as a luxury but as a necessity, like the light in your bedroom closet. 9. Touch faucets. Often found in public bathrooms, touch faucets are gaining popularity in kitchens, and they are very useful. When hands are full, or perhaps contaminated with raw chicken, touch the faucet’s body with an elbow or the back of your hand to turn it on. Touch it again and off it goes. 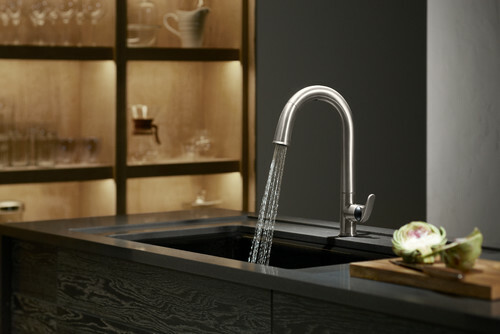 Touch faucets make water more easily accessible for multitasking cooks. 10. Working sinks. Many clients are requesting sinks that double as work stations. These working sinks can be as small as 36 inches wide and as large as 80. Fitted with accessories like cutting boards, colanders, bowls and drying racks, they’re designed to improve function in the kitchen. The latest entry vying for market share is black stainless. It’s impervious to fingerprints, and that is a big, big selling point. Its main drawback is that when scratched — and it will get scratched — the underlying color is stainless, as in silver. I’ve specified black stainless appliances twice in the past six months. Will black stainless have staying power? Only time will tell.